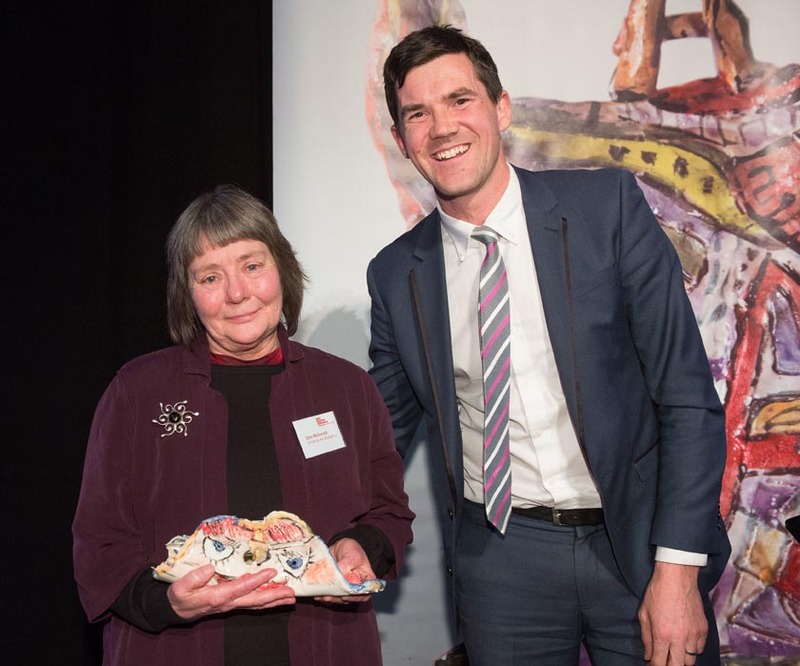 Anyone who knows Glen McDonald, Coordinator of Vincents Art Workshop in Wellington, will tell you about her commitment to creativity, inclusion and community. She’s happy to talk all day about Vincents but uncomfortable when the attention focuses on her. However, she can’t avoid a fuss this time. Glen is the recipient of the Arts Access Accolade 2016, which recognises the lifetime achievements of someone who has played a significant role in working with Arts Access Aotearoa to achieve its vision of a society where all people in New Zealand can participate in the arts. 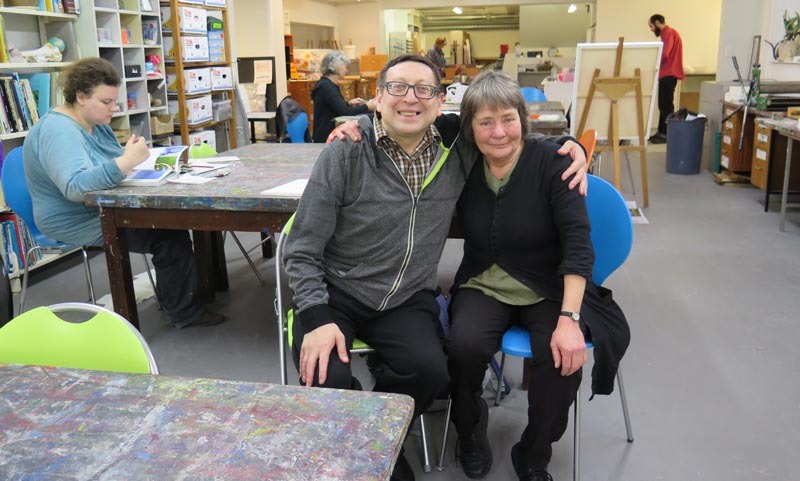 Glen has been working at Vincent Arts Workshop for 23 years and says, “My heart is here.” Her commitment to the arts and inclusion dates back to when she was aged six or seven and she found herself wondering why some people were excluded from society because of their differences. This was the beginning of a life-long focus on human rights issues. Clay was her first foray into art-making when she was eight and she recalls imagining herself as a potter. While playing with clay and colours, she also remembers her growing awareness of the amount of unfairness in the world. Segregation, famine and poverty were problems she saw through her young eyes. Later on, she became a busy mother of four children and for many years, she was devoted to motherhood. But when they grew up and moved on, Glen started to wonder again about her mission in this world. She enrolled in a disability studies training programme and started working with pre-schoolers with developmental disabilities and their families. It was during her studies that she realised what her mission was. She discovered Vincents Art Workshop, a creative space in central Wellington, where everybody was welcome and able to express themselves through creative self-expression. From that moment, Glen knew she had found her place in this world. A mentor to others, Glen is constantly developing new pathways to support creative self-expression for all people by developing networks and partnerships in the community: Vincents Art Workshop ran a mural project with prisoners in Arohata Women’s Prison for two years and has managed a weekly art programme with patients in Te Whare o Matairangi, the Mental Health Unit at Wellington Hospital for the past eight years. Glen and Vincents Art Workshop’s philosophy of inclusion has nurtured other creative spaces around the country. In Masterton, for example, Glen and her colleagues were instrumental in helping to set up King Street Artworks by providing initial financial, managerial and staffing support. 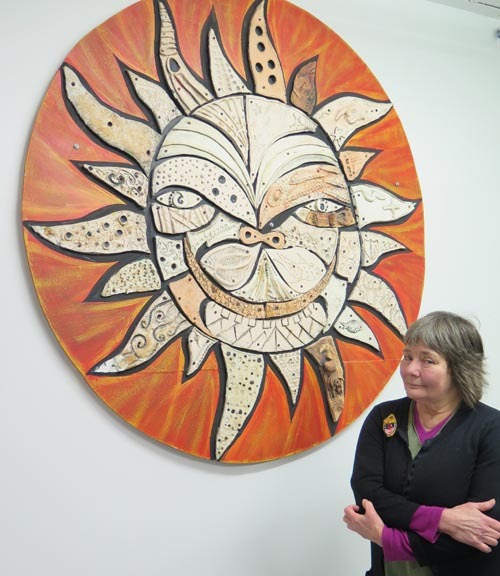 She was also a trustee on the board of Art Access Aotearoa for seven years. One of Glen’s passions is to promote Vincents Art Workshop’s artists and their artwork in the community at places and events such as the Newtown Festival and Wellington Zoo. Her mind is constantly pondering, creating, worrying. She spends most of her time at Vincents but enjoys classical music, good books and the company of Puff, a cockatoo from Wellington Zoo, with whom she has a special friendship. Original generation time 1.6256 seconds. Cache Loaded in: 0.0396 seconds.